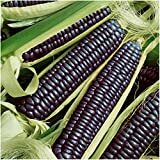 50 Seeds Black Aztec Sweet Corn- Zea Mays - Makes an Excellent Blue Cornmeal.90 Days. 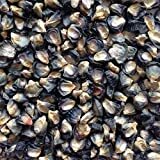 Blue corn seeds for sale – Easy plant to grow with edible cobs, buy grown for the ornamental cobs, flowers or plant, sowing in late winter (in warmer climate) to early spring when start from seeds. 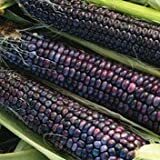 Seeds edible and grow on cobs, seeds can appear in blue color.